What is Marathon & Beyond? 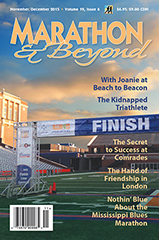 Marathon & Beyond (M&B) is a bimonthly magazine tailored specifically for marathoners and ultrarunners launched in 1997. It is edited and published by former Runner’s World executive editor Richard Benyo and former FootNotes coeditor and Human Kinetics editor Jan Colarusso Seeley. M&B is published by 42K(+) Press, Inc., based in Champaign, Illinois.